These grooves appear on the surface of frozen puddles. Most grooves are straight lines, and most of these also appear to have relatively symmetric sides, such as those marked #s 1, 2, & 4 in the above image. But some, such as #3, have sides that are much wider. Grooves can intersect each other at a "T" intersection, such as #1 and #3, or they can cross, as a 4-way intersection as in #2. Some, such as #4 start and end on nothing apparent and intersect no other grooves. Sometimes the sides show small steps or sub-grooves, particularly on the wider sides, such as on #3. On grooves that curve, such as in #1 and #2 in the image below, one side can have a fern or foliage type of texture. Most snow crystals are single crystals. Being single is an outcome of their growth process and small size. 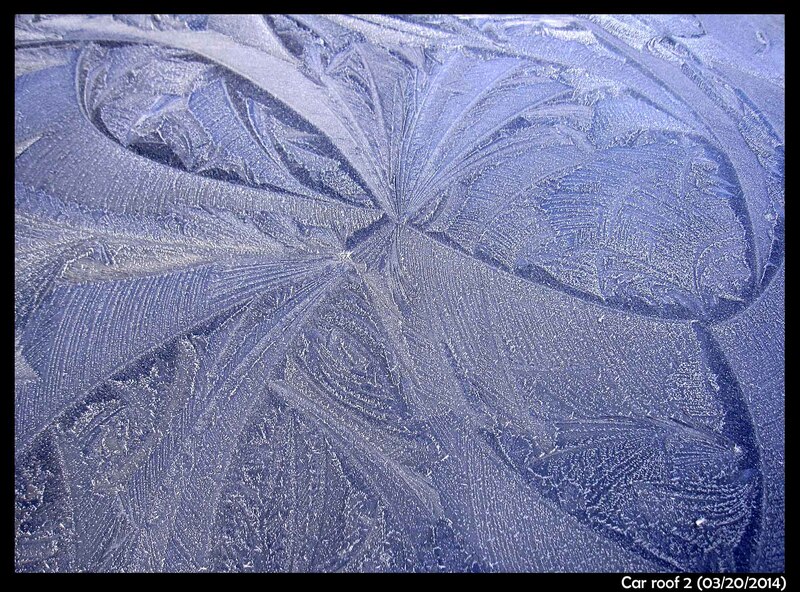 On the other hand, most larger ice formations are not single crystals. These latter types are called "polycrystals". A polycrystal usually appears the same as any other type of ice -- smooth, uniform, clear or white -- just as if it were also single crystal. But the poly nature can be revealed when the ice warms to the melting temperature. At melting temperature, the boundaries between the separate crystals become visible. As an example, note the white lines in the ice in the inset in the image below. 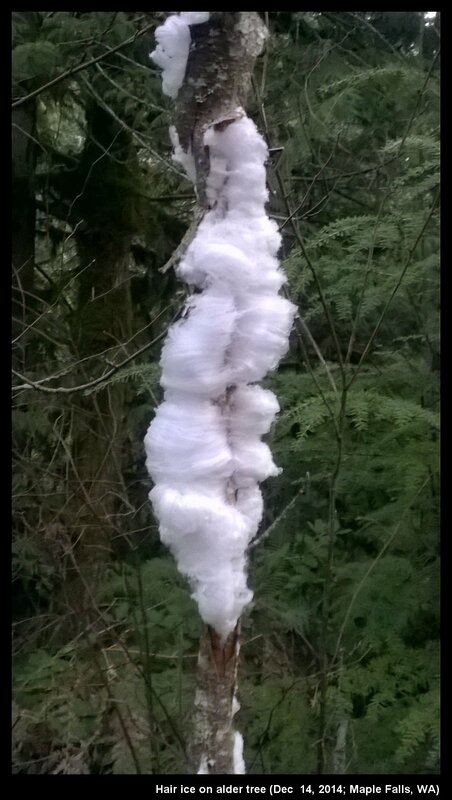 (This image is from the ice drip complex in the previous post.) We call each individual crystal a "grain", and the boundaries between grains as "grain boundaries". The grain boundaries show up because the region has disordered ice that will melt at a lower temperature than regular ice. Thus, the light, upon passing through a grain boundary, will scatter more, making a whiter region, as shown in the image. The ice is thus weaker on a grain boundary and has a tendency to break along these boundaries. On the surface of ponds and lakes, the grains (individual crystals) can be several inches or more across. So, if you get a sheet of such ice, and let it warm up to melting, you will find it easy to break the ice sheet along a grain boundary and thus isolate a large single crystal. 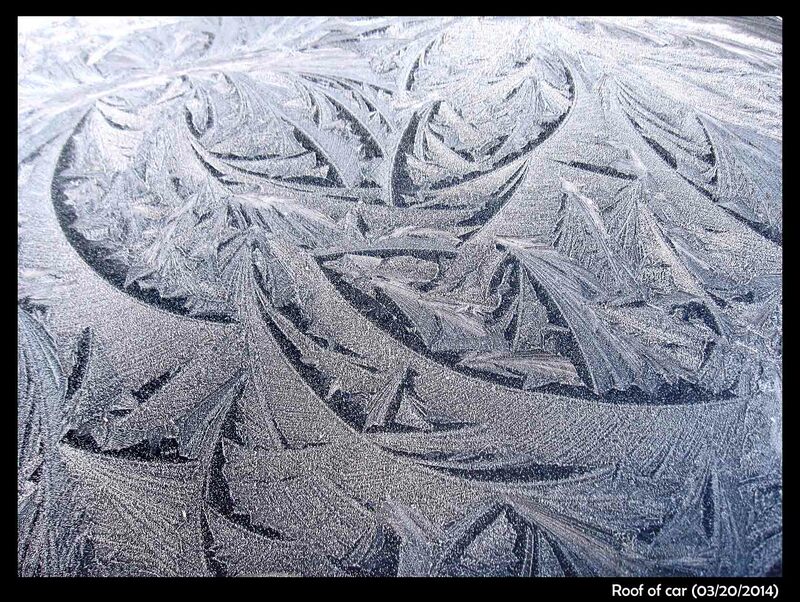 The size and pattern of the grains affect the mechanical properties of the ice. So, glaciologists, who want to know how a given glacier or ice sheet moves, are very interested in such patterns. They call this pattern the "ice fabric". Here's a reed of some sort, with a glaze of clear rime on the side facing a creek. How did the clear ice get there, and what is the white ice on top of it? The fact that the clear ice is just on the side facing the creek indicates that the ice came from droplets blown off the creek. To have the ice buildup just on the side means that the droplets must have frozen soon after landing, but slow enough to spread out and fill gaps. So, the droplet must have been larger than typical cloud droplets, and the temperature must have been within a few degrees of freezing. Clearly, the flowing water must have been above freezing, so the droplets must have cooled to below zero while drifting through the air. A closer shot shows that the outermost ice, the white ice, is hoarfrost. 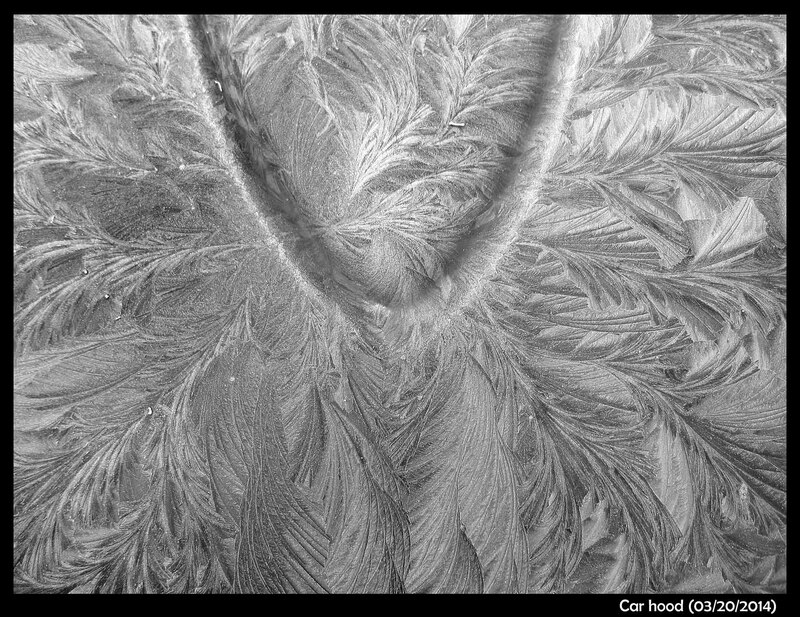 Only hoarfrost would show the flat crystalline facets. 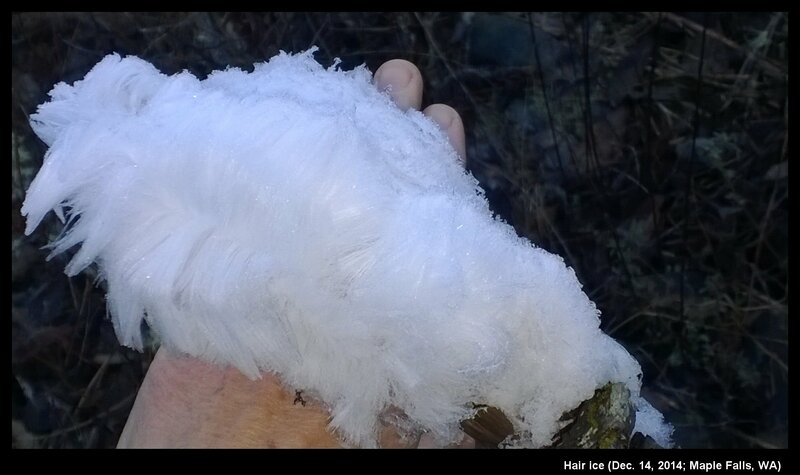 Definitive proof that that ice grew out of the vapor that was blowing by. You can also see some hoar on the other side of the reed. Cold air came down the interior, spilling through gaps in the Cascades, cooling the western side. In the Seattle area, we got our first frost on Nov. 11, but the days stayed cold. Areas in the shade never lost their hoar, so the hoar frost kept growing. 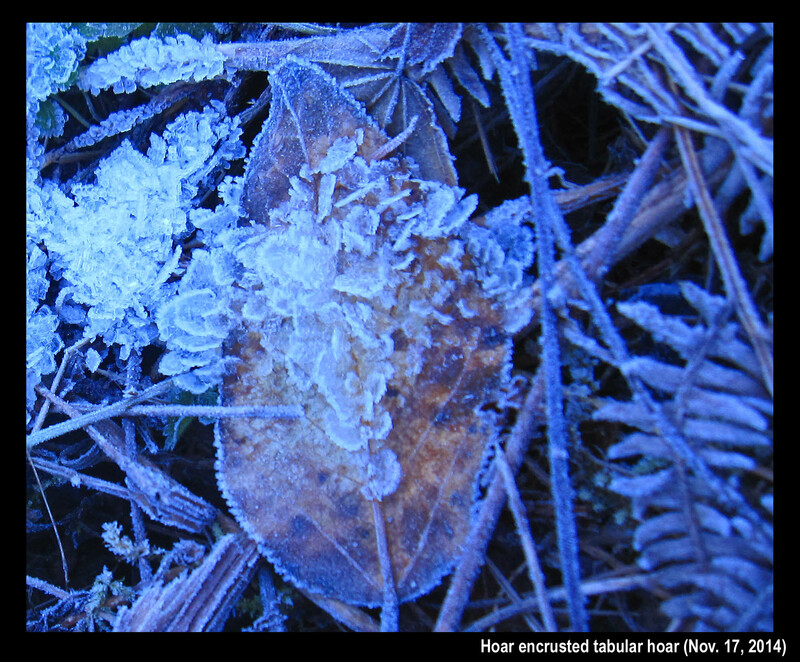 But does a hoar-frost crystal continue growing the same way as on the previous night? Does it keep extending uniformly, getting larger and larger, keeping the same general shape? Or do smaller hoar crystals form on previously grown larger crystals? A few days later, I found myself walking in Maple Falls near Mt. Baker. In a shady pocket near my feet, I saw some hoar. Subtly different -- it appeared like small, translucent leaves encrusted on their edges with hoarfrost. But it turned out that the "small leaves" were actually tabular hoar (plate-shaped). 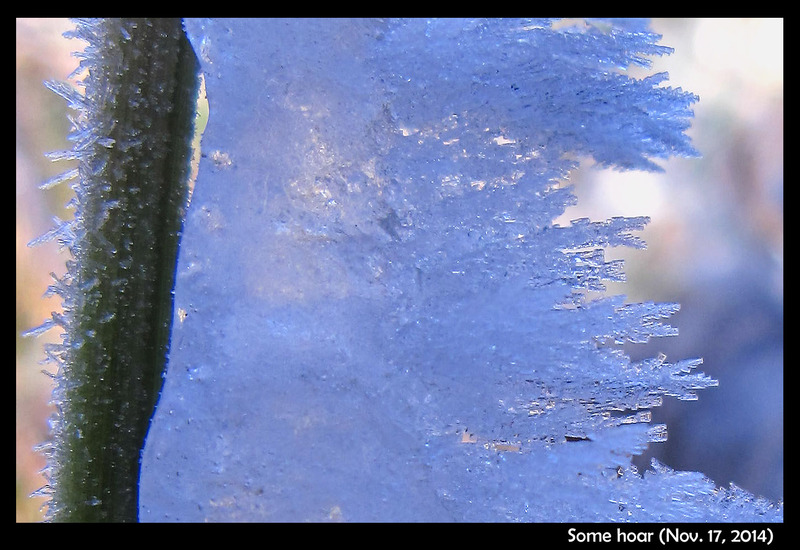 That is, hoar encrusted on hoar: smaller crystals on larger crystals. 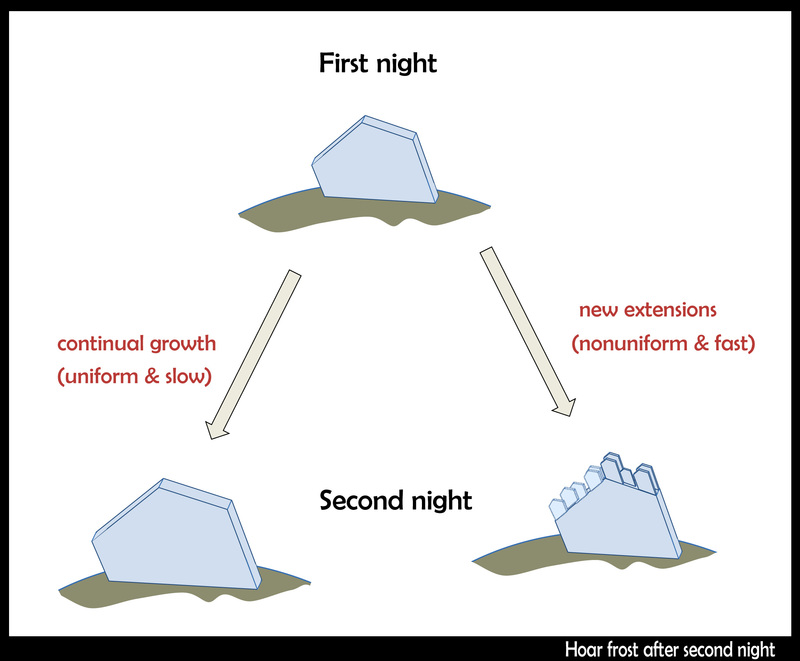 When frost resumes growing on previously grown frost, the other possibility may also happen; that is, the hoar just resumes growing the way it did the previous night. But I think this is generally quite rare because it would require very slow and constant growth conditions, which is generally incompatible with the diurnal temperature cycle. See the sketch below for both possibilities. Note that I write above 'smaller hoar crystals grow on the larger ones' even though technically, they are all the same crystal. You can see this is true by the fact that their faces all line up. In summer, the sun reaches higher elevations, bringing the possibility of new atmospheric displays. I saw this one in mid-June. The top, upward arc is the more familiar and common 22-degree halo. But pay attention to the one on the bottom. Its colors look like a rainbow, but it has nothing to do with water drops of any sort. After a few days of fine bright spring weather, the barometer falls and a south wind begins to blow. High clouds, fragile and feathery, rise out of the west, the sky gradually becomes milky white, made opalescent by veils of cirro-stratus. The sun seems to shine through ground glass, its outline no longer sharp, but merging into its surroundings. There is a peculiar, uncertain light over the landscape; I 'feel' that there must be a halo round the sun! And as a rule, I am right. The quote, from Minneart* describes a common ice-related atmospheric apparition. 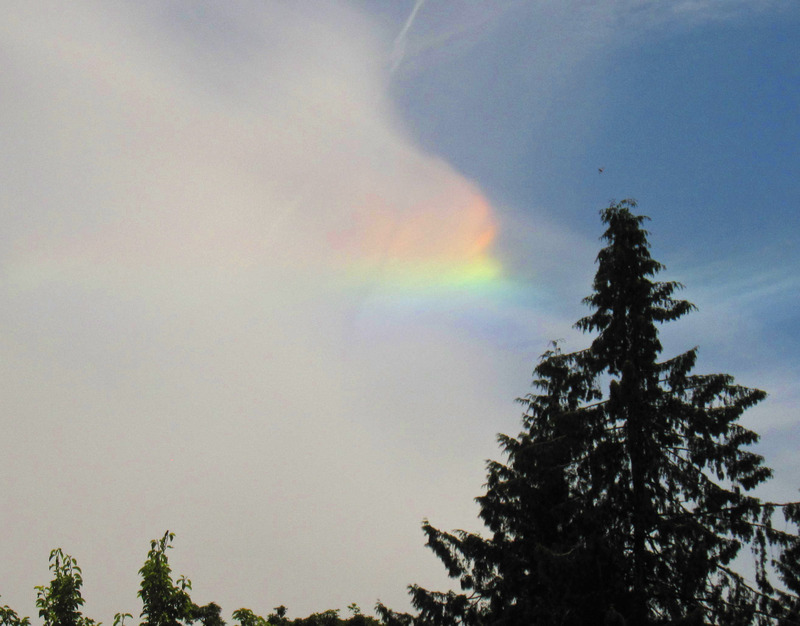 It appears in skies all over the world far more often than the rainbow, yet few notice it. As a graduate student, I read about halos and often looked for one, but didn't notice it myself until someone else pointed it out. As a post-doc in Boulder, I was out walking with Charles Knight, and I mentioned my lack of success. He glanced up near the sun, pointed, and said “why there's one right now”. What I had missed in my readings had been the fact that most halos are rather indistinct and often incomplete circles. Indeed, now when I point out the most common one (the 22-degree halo) to someone nearby, they often don't see it. But occasionally, it is sharp enough (and colored) to the extent that anyone will see it if they bother to look up and glance toward the sun. And often it occurs with other ice-crystal apparitions that are even more obvious. Last fall, while perched high on a rock face, belaying my partner up**, I saw such a vivid display. 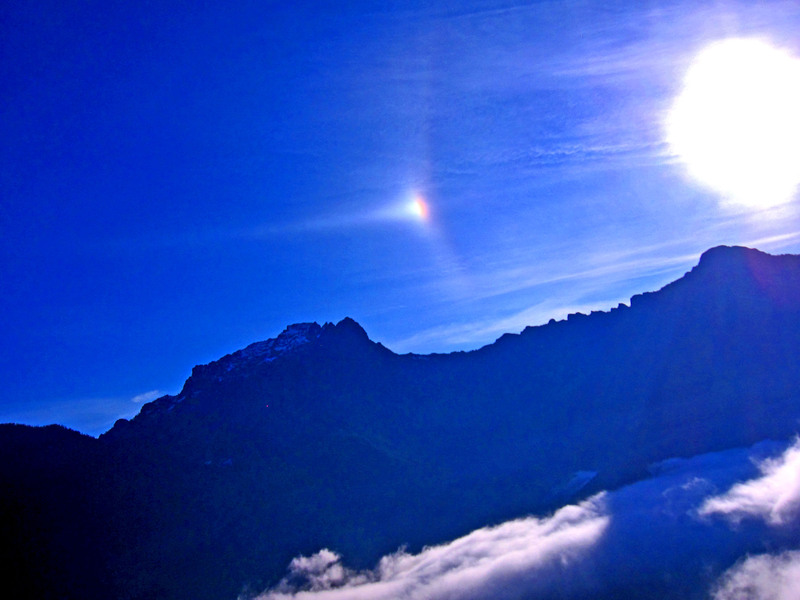 The bright spot is called a “sun dog”, “mock sun”, or “parhelia”. They, one on either side of the sun, usually appear together with the 22 degree halo. 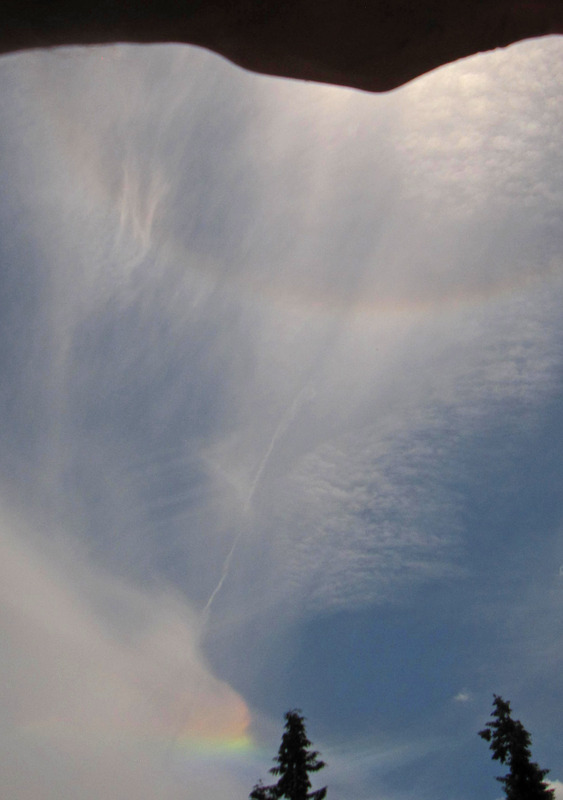 Indeed, the sun dogs very nearly mark the spots where that halo intersects another arc called the parahelic circle. Their cause: horizontally oriented, tabular ice crystals. What you see there is an extremely small, thin ice crystal growing from the tip of a glass capillary into air. (Size-wise, the glass capillary is about 5 micro-meters in diameter, or about 1/10th the thickness of the hair on your head.) I saw it happen several times. As the crystal grew, it developed the prism facets that generally define the hexagonal crystal shape. Other people had seen such rounded growth before, generally within a few degrees of zero (C), though in all cases, the crystal had been extremely thin. 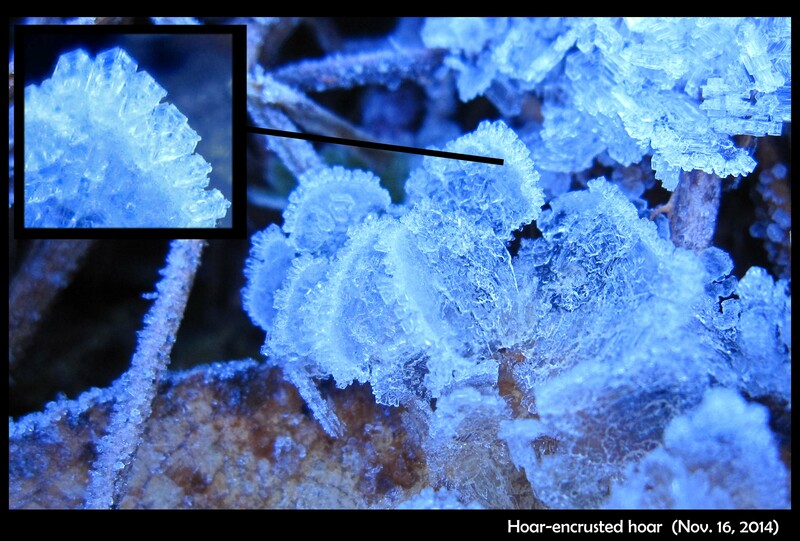 You can also see this thin, rounded (non-facetted) form in some hoar-frost formations. The mystery here is why the disk grows without the prism facets for awhile. I never saw this with thicker crystals, so I formed a little theory. The theory involves the source of the water molecules to the curved region of crystal: some come from the vapor in the air and some wander over from the flat, non-growing crystal faces on front and back. In the 1960s, people had tried to measure this “wandering distance”, but never determined a consistent value. My theory predicted that once the crystal thickness exceeded about twice this distance, the curved edge would transition to flat, giving rise to the hexagon. That sequence shows the side and front view. The crystal doesn't discernibly thicken when the flat prism facets appear. Zing! That theory shot down. On to the next pet theory. So maybe the key factor is the diameter of the disk: One might argue that the curvature of the crystal surface must be below a certain value, which means a large enough diameter is needed, for the flat facets to appear. Or, the size of the resulting prism faces must be larger than that needed to have several surface steps (which help ensure flatness). In that case, I see both smaller and larger prism faces forming at the same time (same thing can be seen in the previous image). So, I guess the curvature or size of the resulting face is not the main factor. Zing! Some researchers had observed slight bending of the prism facet above -2.0 C in equilibrium. They postulated a “roughening temperature” at -2.0 C. This might explain the rounded disc edge, but wait! 1) This disc edge becomes facet as it grows, so it is not merely temperature, and 2) these crystals are below -2.0 C.
Well, there are always “impurities” to blame! Crystal growers are fond of blaming some trace, active chemical, or “impurity” for inexplicable results, so we could theorize that the above show the effect of surface impurities. As the crystal grows, the area over which the impurities distribute increases, thus diluting their concentration, and thus reducing their effect. Yes! This could explain these results. The above shows two sequences (same capillary) in which some prism facets have formed, but some remain round. In the right-side case, one corner even rounds as it grows. Hmm, not a likely result of impurities. Zing! So, I am down to one last theory. I do not yet have the data to shoot it down. And I'm not telling you, or I'd ruin the fun. We just need more data. The great beauty of science: the slaying of a pet idea by a simple observation.